Original Art Studio: Is it just me? 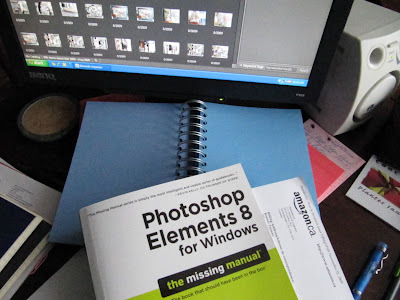 This is how I have been spending my last two mornings - trying to move hundreds of photographs of my paintings from where they are currently stored, into Photoshop Elements 8. 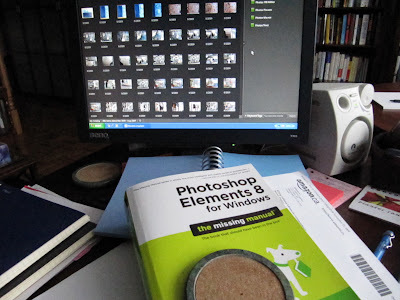 Thousands of photographs are waiting to be transferred to their new Photoshop home as well. I've been procrastinating about this chore for weeks. Since I have never been technically, electronically or digitally adept (being more of a right-brain, creative type than a left-brain, logical one), I find I am somewhat challenged by even the basic steps. Grrrrrhhhh. I really have to exercise persistence and patience to manoeuvre my way through all the instructions, steps, terminology, missteps, oopsies, accidental deletions, etc. etc. Sitting here doing this sort of work forces my brain into areas it prefers to leave dormant. I just want to paint! I don't want to catalogue my paintings! I just want to take marvelous photographs! I don't want to sort them into catalogues, albums, sub-albums! I don't want to have to assign tags or labels and certainly not captions! My musculature tenses in silent rebellion. This is not my 'default modus operandi'! I am an 'artiste'! (That's a joke, peeps.) I think I have raised my blood pressure with my mental and physical resistance to all this left-brain cataloguing. I will be able to handle editing. That is so much more creative. Why editing is enjoyable and fun. Creating order, files, lists, catalogues, catagories, tags, labels IS NOT. Yes, I'd rather be painting. In fact, given the choice I'd rather clean a bathroom. Oh, what a good idea - I must clean a bathroom right now. Organization, order, files, albums, categories, frustration and boredom will have to wait. I know I can find a toilet to clean. And then another....and another. Why didn't I think of that before? There's nothing orderly or left-brain about toilet cleaning. Why I can squirt liquids, swirl brushes, make bubbles, splash, flush, dance around and sing.....It's almost as good as painting! Get a Mac. Seriously. I've been in both worlds. If you are a "right brain" thinker, you'll LOVE the Mac interface. I almost break out in hives when my life makes me get near a Windows machine. This made me chuckle. I am actually quite good at organizing things, and for some strange reason, I find I have become quite a "techie" and I am known as the "go-to" person at work where computers are concerned. I think it taps into my *cough* OCD, and my need to keep things organized. Ha... just taking a quick break... from cleaning the toilets!! I can't tackle anything too daunting right now as the boys are insisting on loudness and chaos! So yes, cleaning the toilets does the trick! Who knew cleaning toilets was the way to restore order to the world! lol. i feel your pain...T is so much better at the organizing on our end. Not to sound like a broken record (and the first thing I did was look at the picture to if you had a Mac), but I love my Mac. It's all I've ever had. Oh Bonnie, I don't envy you this one. A 600-page manual, for god's sake!! 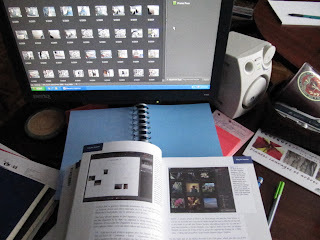 But the end result will definitely be worth it, and your creative forces will benefit from the tidiness of your files. Of this I am completely and absolutely certain! Good luck.